— As you judge, you will be judged. Judgement and discernment are different, but to love well, God’s Judgment is required. For us this creates 3 practices. Avoid Hypocrisy, Have Integrity, Be Merciful. This is the fourth sermon for Rick Warren’s 40 Days of Love Campaign. Being Judgmental is a bad thing. However, judgement is a fundamental and important part of loving God and Loving others. In fact, you can’t have love without judgement. However, it is not OUR judgement that we need to have. We need God’s perfect Judgement. In order to be better lovers and have better relationships, we have to let God be the judge. This is not easy, but if we avoid hypocrisy, have integrity, and practice mercy, we can use God’s judgment to love others well. We are not judgmental when we let God do the judging. That is what we are going to look at this morning. So far, in the past three sermons we have explored three key insights that God wants us to understand about Love. First, God wants us to love with the same kind of love that Jesus has for us. Nothing less than self-sacrificial and pure love will due. Loving God and other people is the very purpose that we exist. Second, Busyness in our life is the enemy of Love. If you want to be a better lover, you have to slow down, and make intentional space in your life to practice love. Third, loving like Jesus is impossible without God’s supernatural help. Good thing God is ready and able to help through the Bible and the power of the Holy Spirit. Today we look at a Fourth insight that God wants us to understand about love. That is that real love requires God’s perfect judgment. Let us begin by talking about what judgement means. Judgment, means to pronounce something Good or Evil. Another way to say it is to pronounce something right or wrong. Being a judgmental person means that you like to pronounce things right or wrong. In order to Love like God loves, judgment is necessary and good. The famous love passage of the Bible, 1 Corinthians 13 says that love, “…does not delight in evil but rejoices with the truth.” The only way love cannot rejoice in evil is to know what the difference between right and wrong is. But who are we to judge our neighbors? We cannot see into our neighbors hearts. So we don’t ever know 100% what is right. Proverbs 14:12 says, “There is a way that seems right to a man, but its end is the way to death.” Being judgmental toward God and others can kill love. I have seen being judgmental destroy love more completely than anything else. Here is an example of how it often goes. Themla and Nancy have been friends since they were kids. They raised their families together, went on vacations together. They have been friends for more than 30 years. But last year, Thelma and Nancy stopped talking to one another. Thelma had an argument with her son, Bill. Her son was cheating on his taxes. Thelma got so outraged at her son Bill that she vowed that she would never make him another nut roll until he quit cheating on his taxes. That is a big problem because Bill loves his nut rolls. So Bill called Nancy, who was like an Aunt to him. He showered her with praise, and told her how mean and harsh his mom was being. And so, Nancy made Bill some nut rolls. Well, Thelma found out about this right away, and she was so mad that when the families got together for Christmas the next weekend, Thelma chewed out Nancy in front of both families. It was bad, and embarrassing. Thelma was shouting and saying how horrible and bad Nancy was for undermining her. They have never spoken since. Thelma is sure that Nancy acted wrongly on purpose, and she is in the right. Nancy is sure that Thelma acted wrongly on purpose and that she was in the right. Total deadlock. Well, we know that both of them are being judgmental. But we are not emotionally involved. Too often, our judgment is clouded by our emotions, and our ignorance. I know this is true about myself. When I feel strongly about something or someone, my judgment is influenced. I make judgements about people’s motives that go along with my feelings. The only way to be loving and not judgmental is to let God be the judge. There is a practical way to do this. In a word, discernment. 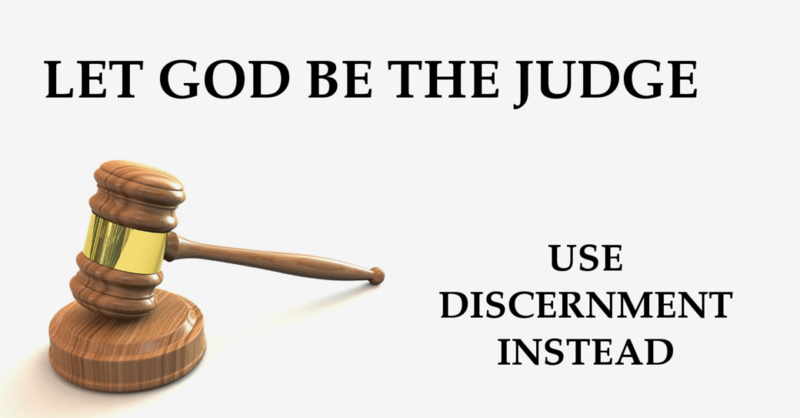 Discernment is related to judgment, but with one MAJOR difference. Discernment leaves open the possibility that we might be wrong. Discernment means to perceive or observe something. Judgement means to pronounce something good or bad. Judgment is a statement of fact, Discernment is a well-informed opinion. Do you see the difference? We are not able to judge, but God instructs us to discern. For example, we are charged in Romans 12:2 “Do not be conformed to this world, but be transformed by the renewal of your mind, that by testing you may discern what is the will of God, what is good and acceptable and perfect.” We are called to discern and to test all things to see if they are right. But final Judgement belongs to Christ alone. Discernment leaves room for Christ to have the final call in matters of good and evil. When we are discerning, we are not being judgmental. Discernment in relationships is hard, but there are three practices that we can use to be discerning in our relationships. The three practices are 1. Avoid Hypocrisy. 2. Have Integrity, and 3. Have Mercy. Our scripture reading from Matthew today highlights these three practices. The first way we can love others with God’s judgement and not our own is to avoid hypocrisy. Simply put, hypocrisy is pretending. However; being a hypocrite isn’t just pretending to be something you are not. In our scripture this morning, the person who is trying to take a speck out of another’s eye but pretends they don’t have a plank in their own eye is being a hypocrite. In this teaching, Jesus makes it clear that Hypocrisy is pointing out someone else’s wrong while being unwilling to admit or consider the wrong in your own way. When we deal with God and others in our relationships, hypocrisy undermines love. More simply put, Hypocrisy is a “Holier than thou” attitude. Tom Holladay writes that it is the same thing as saying to kids, “do what I say and not what I do!” If we want to be loving to God and others, we must not be hypocrites. Practically, we can avoid being hypocrites by following a simple practice. We can be very careful about how we point out the wrong in the life of another. We must always be willing to explore the possibility that what we might be wrong. And easy way to do this is to start our conversation with the sentence, “I might be wrong.” It may seem silly, to say to someone, “I might be wrong. You probably should not be stealing money.” Of course we know that is wrong! But it is a habit thing, and a humility thing. It shows the other, that you love them because you are willing to acknowledge your own plank, and not just complain about their sawdust. The second way we can love others with God’s judgement and not our own is to have integrity. Integrity means that we are willing to make time to examine our hearts and actions. In our scripture this morning, Jesus teaches that when it comes to relationships, before we go around pointing out specs in other people’s eyes, we should FIRST, take the plank our of our own eye. Integrity will build loving relationships, while lack of integrity will destroy them. You have all seen lack of integrity destroy loving relationships. Perhaps you know someone who keeps a list of all the things you have done wrong. Does that person have a list of things they have done wrong? Integrity is one of the reasons why we take a few moments in silent confession every Sunday. Spend a little time every so often looking for planks in your eye. There are many ways to do this. Some people journal, some people pray, some people have accountability partners to help them. To have integrity in our relationships, we need to take time for self-reflection and review. But it is not enough to see the planks in our eye. To have integrity, we must also attempt to remove the planks. Once we identify wrongdoing in our life we must at least attempt to right it. This is how we have integrity and build loving relationships. The third we can love others with God’s judgement and not our own is to practice mercy. Jesus models this for us in the Lord’s Prayer. We are to pray, forgive us our debts, as we forgive our debtors. God has been merciful to us all. In Jesus Christ, God has forgiven us from all our bad choices. When we believe that Jesus is Lord and Savior, God is willing to remove all the planks from our eyes. And there are many. That’s what God does. And that is love. Practicing mercy in our relationships is helping others remove specs from their eyes, after we have attempted to remove the planks from our own. God does not simply ignore our sins when we believe in Jesus. No, God gives us the Holy Spirit to help us stop sinning, and to become more like Christ. That is God’s loving mercy. Likewise, we must lovingly help others deal with their sin problems. We can do this by acknowledging other’s sins while at the same time accepting them. This is how Jesus behaved. Once we see the planks in our eyes and try to pull them out, then we can approach relationships with loving mercy. What does this look like? Instead of saying to someone, “Stealing is wrong, you should stop doing that immediately.” Which is dismissive, You might say, “I noticed you were stealing money from the cash register, what is going on with you? What do you need help with?” This acknowledges the person’s sin but also lets them know that they are accepted, as they are, and that hey are valued and loved. Jesus was a master of mercy. An example is when he saved a woman from being stoned to death in John chapter 8. After Jesus dismisses the crowd who want to stone the woman, ‘Jesus straightened up and asked her, “Woman, where are they? Has no one condemned you?” “No one, sir,” she said. “Then neither do I condemn you,” Jesus declared. “Go now and leave your life of sin.”’ Jesus helped her but did not ignore her sin. In today’s world, we are told that love is accepting people without comment on the choices they make. This is not love. We are called in love to help people deal with their faults and bad choices, not to ignore them! Mercy is accepting people as they are, while acknowledging they are both saints AND sinners. This is what it means to love others like Jesus loves us. If you want to love well, judgment is necessary. But we need to let GOD be the judge of people and actions. We can do this by being discerning instead of being judgmental. Discernment leaves room for the reality that we are all sinful and that we might be wrong in what we think is right. We still try to do what is right, and combat evil, but we leave final word up to God. We can practice loving others in this way by avoiding hypocrisy, having integrity, and practicing mercy. The more we do this, the more we will be able to build strong loving relationships with God and one another that are truly fulfilling.